I have been away from this blog for a loooooong time, but have been sent back here today by an interview with the fabulous Richard Glover of 702 ABC Sydney, who had me on his Drive show to talk about a prize I won last night – and about FISH! First, the fish – it’s Easter, and lots of people like to keep to tradition and eat fish on Good Friday. At the last moment Richard asked me t0 stay on for his segment with the beloved Simon Marnie, weekend ABC Radio host, gourmand and excellent kitchen knowhow guru . I was asked for my go-to fish recipe, which had to be the Five-Minute Feast dish we eat at least once a week, of Salmon with Mirin, Ginger & Soy. I posted the recipe way back in 2009, and here it is. These days I add a sliced red chilli to the mirin/soy mix, and sometimes some finely julienned red capsicum. And we add lots more greens of whatever variety are about – broccolini, or bok choy, whatever you like. Just before that Richard and I were celebrating Australia’s independent bookselling scene, because our beloved indie stores yesterday chose my novel The Natural Way of Things as their Indie Awards fiction category winner, and then their overall Book of the Year. I can’t tell you how much this means to me, but those who were in the room and saw me blubbing like a fool might have got some idea. Richard, by the way, was also shortlisted for his brilliant, funny and very moving memoir, Flesh Wounds. The excellent folk at Allen & Unwin have posted my speech about bookstores on their blog, and I thought, ‘what a good idea’. So here are my thoughts about independent bookstores and what they mean to us in Australia. I am so very touched by these awards, and so grateful. Thank you for this honour. I would like first to thank the Independent Booksellers of Australia for your support of my novel. From offering me the chance to speak at the Leading Edge conference in May last year to choosing it for book clubs, to all the bookshop events, social media postings – and, most of all, the truly enthusiastic hand-selling of my novel, I owe you all so much. I would also like to honour my fellow shortlistees. Gail Jones, Stephanie Bishop and Geraldine Brooks are writers I have long admired and whose accomplishments I celebrate. Book prizes are a strange phenomenon, and the way they are discussed can sometimes give rise to the depressing idea that the creation of literature is a contest, with one writer pitted against another. I honestly feel that nothing is further from the truth. All writers work in quiet, often lonesome isolation, each pursuing our own particular truth, each trying more than anything to make a strong and beautiful work of art. Yet despite this essential seclusion and the equally necessary differences between our literary projects which thankfully makes comparison impossible, we are also a community. Not a competition, but a flourishing community of quiet creators. I thank my fellow writers for their encouragement and solidarity over the years – and I offer mine to them, always. Independent booksellers in so many ways connect and support and build this community of writers. We could not make our work without you. I also thank my beloved publisher Jane Palfreyman and editor Ali Lavau and all at Allen and Unwin who have been so overwhelming in their support. I’m sure every author in this room has faced moments in the writing of a book where you can’t see a way forward. The book defeats you – uneven, unresolved, shameful in its ragged, state. You have a deep urge to finish it but every logical part of your mind wonders, why? It was at one such moment, about fifteen years ago, that I left my desk in a state of despair and went for a walk. My first strange little novel, Pieces of a Girl, had mercifully been published but died soon into its short life, sent to the great pulping station in the sky. I kept writing, struggling along with a second novel that wasn’t working. All the time I was working against these questions: Why am I doing this? Who wants this? Who will even notice, let alone care, if I never write another book? I have no idea what I said in reply. I am sure I was ungracious, from shock. But I can tell you that this moment of generous noticing from the bookseller, Karen Ferris, was a watershed moment in my writing life. If Karen cared that I finished my book, maybe someone else would. More importantly, maybe I could care, and keep going. Since that moment I’ve felt the same kind of noticing, and caring, from so many independent booksellers, quietly urging me on through the writing of all my six books. Some of those books sold okay, and some didn’t, but the support I felt from these people never wavered. I want to particularly thank Barbara Horgan (formerly of Shearers and now of Boffins Books in Perth), Karen of course, now with Berkelouw, Kathryn Bancroft and Jenny Barry at Books Plus in Bathurst, Anna Low and her beautiful team at Potts Point Bookshop, Natalie Yabuka and Jeremy and all at Oscar and Friends in Double Bay and Surry Hills, Scott Whitmont at Lindfield, Lindy Jones and the team at Abbeys, Fiona Stager and Krissy Kneen and everyone at Avid Reader in Brisbane, David Gaunt and Morgan Smith at Gleebooks, Gillian May at Berkelouw Mona Vale; and Mark Rubbo, Chris Gordon and everyone at Readings in Melbourne for their sustaining care over the years. One of the pleasures of sending The Natural Way of Things into the world has been meeting a whole new lot of booksellers, whose enthusiasm for it has been astounding to me. As well as those already mentioned, I thank the unstoppable Amelia Lush at Better Read than Dead, Gavin Williams at Matilda’s in Adelaide, Dan Sanderson and Nikki Anderson at MUSE Canberra; Clive Tilsley at Fullers, the amazing Natasha Boyd of Book Bonding in Essendon, Jay Lansdown from Constant Reader, Paul Macdonald at The Children’s Bookshop and the indefatigable Suzy Wilson at Riverbend Books in Brisbane. Of course, I know there are so many others I haven’t named, and others not met, but who have gone out of their way to press my novels into readers’ hands, and I cannot thank them enough. Recently I saw a news item about the Svalbard Global Seed Vault, a bombproof storage bank built deep into a mountain in Norway, in the remote Arctic Svalbard archipelago, about 1300 kilometres from the North Pole. Countries from all over the world send seed samples there to be protected and preserved; the Vault’s mission is to provide a safety net against accidental loss of diversity in traditional gene banks. 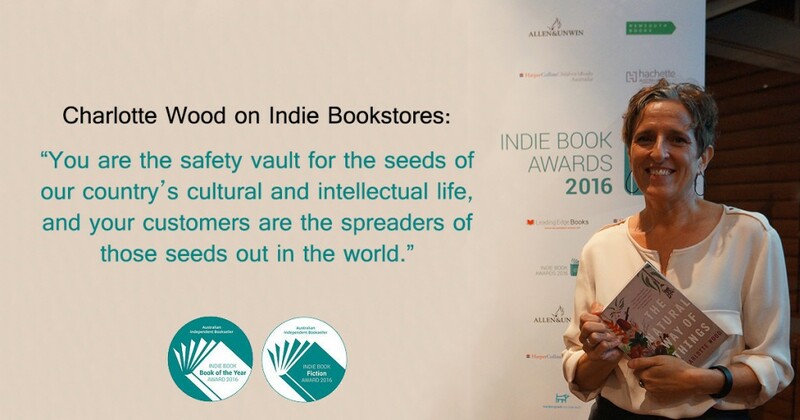 In thinking about tonight, and Australia’s independent booksellers, it struck me that you are like that seed vault. You are storehouses for the kernels not only of our literary culture but our history, our music, our food culture, our health and legal and technological culture, our visual arts, our politics. You are the safety vault for the seeds of our country’s cultural and intellectual life, and your customers are the spreaders of those seeds out in the world. A few years ago, the outlook for our independent bookselling scene looked gloomy. But like those seeds packed into the cold mountain in Norway, you have survived, you are thriving, and because of your noticing and care, your love of words and your determination to flourish, you have kept Australian literature and our culture alive and thriving too. On behalf of us all, I thank you so very much. You can listen to Richard every weekday here – and see more about the Indie awards and the other category winners – brilliant writers all – here. The best thing about Shanghai for us was just strolling the streets, and clapping eyes on a new kind of street food stall every day. Lots of snack foods are sold from carts and barrows, and others from shops with windows into the street. Gives new meaning to the term ‘fast food’ – while there are lots of regrettable imports (think Subway and Domino’s Pizza, for sobbing out loud), these stalls are extremely popular with Shanghai locals and lots of anglos too. The several kinds of breakfast pancake were our particular faves as we strolled in the early morning to check out the 7am park life (thousands of people doing their own thing – from tai chi to fan dancing to shuttlecock, parks are a blur of colour and movement in China in the mornings). Here are a few of our favourite street food things …. if you click on the photo you’ll get a larger version and a wee description. And hopefully if Hamish manages to drop in he might tell us more about these morsels he gets to try every day, the lucky devil. Next post, hopefully some street food video! You are currently browsing the archives for the fast food category.